Bring your whole family to search for that great pumpkin! We have pumpkin wagons ready for your convenience. After you pick your pumpkins out, you can weigh them and check out at the garage or the greenhouse during our open hours. All other times we are "Soft" Open which means you can walk to the patch whenever you want, but no wagon ride unless you book it for a group. Pumpkins are 25 cents per lb for Orange pumpkins, & 20 cents per lb for solid green pumpkins. Never pick a pumpkin up by the stem! They break off! Do green pumpkins turn orange? As long as the pumkin has started to turn orange, it will continue to orange-up if given a nice sunny location that is protected from extreme cold. I saw this beauty growing in the North field. There are loads of huge pumpkins this year! Many varietys too--including my favorite, the Wolf pumpkin, known for its thick gnarly stem. 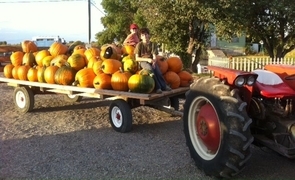 THOUSANDS of pumpkins to choose from!